Portugal have reported no injury concerns ahead of their clash with Spain but question marks remain over their starting line-up. Jose Fonte and Bruno Alves are vying to partner Pepe at centre-back, while either Andre Silva or Goncalo Guedes will join Cristiano Ronaldo in attack. Daniel Carvajal returned to training for Spain on Tuesday following a hamstring injury but remains a doubt. Alvaro Odriozola will deputise at right-back should Carvajal miss out. What a difference a day makes. On Monday, Spain were among the World Cup favourites. On Tuesday, their coach had agreed to join Real Madrid. By Wednesday, Julen Lopetegui had been sacked and their campaign was in disarray before a ball had even been kicked. Despite reports suggesting players were against his sacking, and Lopetegui’s 20-game unbeaten record, Spanish Football Federation president Luis Rubiales said he had been “compelled” to make the decision after finding out mere minutes before Real issued a press release. 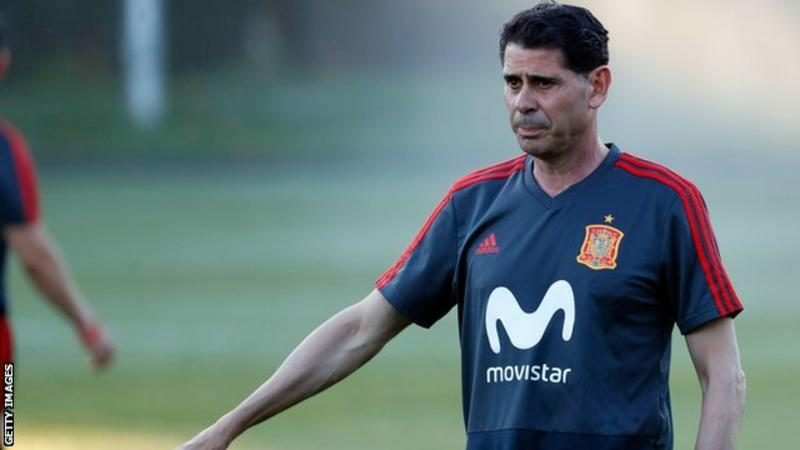 Former Spain captain Fernando Hierro has moved from his director of football role to take over as coach, but Portugal will surely smell blood in a game that promises to be tight. Of their four meetings in major tournaments, Spain lead by two wins to one (if you include a victory on penalties), with only four goals scored in those matches. Much may rest on the performance of Cristiano Ronaldo, who will be managed by Lopetegui at the Bernabeu next season. With 43 goals for Real this season and club loyalties out of the window, don’t be surprised if Ronaldo twists the knife. Spain head coach Fernando Hierro: “We’ve come to fight for the World Cup. We have a great opportunity and that should be the focus. Whoever wins this game will top the group and I am backing Spain to edge it. Spain and Portugal have met on 35 occasions. Spain have 16 wins to Portugal’s six, with 13 draws. The only World Cup meeting was in 2010, when Spain triumphed 1-0 in the last 16. The squads have 43 Champions League winners’ medals between them (Spain 34, Portugal nine). Portugal will attempt to become only the fourth nation to win back-to-back European Championship and World Cup tournaments. The others are West Germany (Euro 1972, World Cup 1974), France (World Cup 1998, Euro 2000) and Spain (Euro 2008, World Cup 2010). Cristiano Ronaldo was directly involved in a competition-high 18 goals in European qualifying, scoring 15 and assisting three. However, he is yet to score in 340 minutes of action against Spain. Portugal have lost only one of their last nine World Cup group games, a 4-0 loss to Germany in 2014. Fernando Santos has reached the knockout stage in all three of his major tournaments as a coach. He led Greece to the quarter-finals of Euro 2012 and the last 16 of the 2014 World Cup, before guiding Portugal to victory at Euro 2016. Only one of Portugal’s 43 goals at the World Cup has been scored from outside the penalty box. Spain have finished top of their group in three of their last four World Cups. However, they have won only two of their last 12 opening games (D3, L7). They have qualified for their 11th straight World Cup – their longest streak of participations. Spain have not lost a World Cup qualifier since 1993, but have lost three of their last six group games at the tournament. None of Spain’s last 14 games at the World Cup have ended in a draw (W10, L4). Spain were one of four teams to remain unbeaten in European qualifying – along with Belgium, England and Germany – winning nine of their 10 games. Six members of Spain’s squad won the 2010 World Cup – David Silva, Sergio Ramos, Andres Iniesta, Pepe Reina, Sergio Busquets and Gerard Pique.